Everyone, be it an individual, business or organization puts in a lot of time and efforts in creating a mobile app. Everyone wants their apps to succeed but many of them fail, and one of the major reason for it is, app users do not like the design and find it difficult to fulfil their basic needs for which the app has been developed. Good marketing might be able to get in some initial download numbers, but if the UI and UX of app is not good then users will uninstall the app. And for real success it is not only the number of app downloads that matter throughout but also the number of active users. 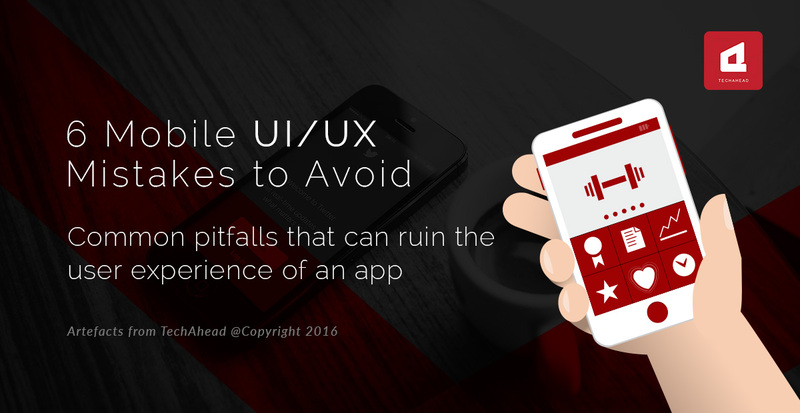 Here are six of the most common UI/UX mistakes that instead of encouraging users to return back to app, force them to uninstall the app forever because of its bad user experience. There’s nothing more annoying to the user than finding an Android app designed to be an exact duplicate of its iOS counterpart. Every platform user must feel the same way when they see a non-native appearing app. Consistency to the platform should supersede consistency to the product. The mobile UX is unique and requires specialized design and interaction patterns for different platforms. Users hate filling lengthy forms during sign-up. Apps must avoid multi-page signup process, asking users to fill in a lot of details. Also when users are made to go through a sign-up process or hand over their email or social credentials before app has demonstrated them any clear benefit, it causes many users to end session without registering and usually followed by app uninstall. The app must show the user its value and prompts user engagement, so registration will be a natural action and not one that is compelled. Information without context is hard to digest, and very easy to forget. If the user experience requires explanation, prompt the user when the feature in question is being used. One of biggest yet common mistake in many apps is that they flood new users with a detailed tutorial about everything the app can do on the very first launch, alienating many app users in the process. When designing a mobile app user experience, it is critical to continually view and interact with design on the device itself. Make sure the UX is working as intended. Or else in final test release of app it is found that everything is of different size, that button which were perfectly placed, can’t be reached with a human thumb, the button at the bottom is not visible at all, etc. When designing an app, designers must really know who exactly they are designing it for. The average age of App developers is in the age range of 30 to 55, also known as Generation Xers. On the other hand two largest demographics (in the US) are Baby Boomers (55+) and Millenials (Under 30). For a great user experience the app should be created keeping in mind the users it is supposed to serve in majority. While creating an app one should focus on the development and designing of an app. Certainly aim for providing memorable user experiences (UX). Mobile UX is less about technology and more about emotions. While creating an app, certainly aim for providing memorable user experiences (UX). Mobile UX is less about technology and more about emotions.